The best way to enjoy an egg doesn't involve any butter or cheese! Really! I know all those quiche lovers out there aren't going to believe me - but you have to give this a try. For some reason, after the American Revolution, the early British settlers moved away from a British style of cooking eggs called "soft-boiling". Perhaps they needed to leave their ancestry behind or maybe they just forgot, but they BLEW IT because soft boiling is a delicious way to enjoy an egg (and it involves NO extra calories). I was first introduced to this style of cooking in Australia. My husband is Australian, and he took me to breakfast in Melbourne and I had (get this) a soft boiled DUCK egg. I thought I had died and gone to heaven. But, it still took me almost 3 years to attempt this maneuver in my home. Why? Because, you need to proper spoons and egg holder. 1. You need proper spoons to get the egg out. 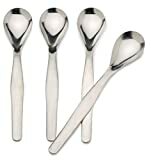 A teaspoon will not work as well as an egg spoon. Trust me - I tried it. The only place I could find them was Amazon. For a mere 63 calories, you get this creamy and nutritious treat. I have mine for breakfast with a few "soldiers" of Toast. Just cut your 100% whole grain Toast into strips to dip in in the egg. YUM! Have you ever tried soft-boiling an egg? My Grandpa made this for me all the time when I was little! I found four cute yellow egg cups that looked like tulips at Tuesday Morning a couple of years ago for a steal! I love this for breakfast :-) Thank you for the post, brings back lovely memories! This has been my absolute FAVORITE way to eat eggs since I was tiny. One of my favorite comfort foods. When I was very small we had an egg cup that was in the shape of a clown and we called it the clownie cup and my brother & I used to fight over it. My mom still has it! these take me back to my childhood-- and I have collected any old or pretty egg cup I could find over the years just because they are (can be) pretty ! Thank you so much for this post. My husband is Canadian by way of Great Britian and he enjoys soft boiled eggs also. I can't count the number of times he's order soft boil and had to return them. What a lovely surprise. I'm going to order the spoons & egg cups. The foolproof way is to start from cold, then as soon as the water boils turn off the heat, put on a tight lid and set the timer for 2 minutes for a very soft boiled egg, maybe 3 minutes if the eggs are very large. You need to look on ebay for the egg cups. Your post made me decide to get some since we have just started raising chickens! I am bidding on some adorable egg cups from the UK that have chicken pictures on them, they're so cute and not at all expensive! Oh dear, I was outbid! Ok, which one of you got them??? 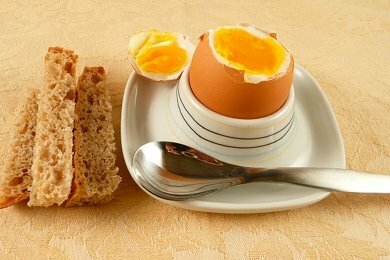 This was my mother's favorite breakfast; she called them "dippy eggs". I inherited her special scissors designed just for cutting the top off. I know what I'm having for breakfast tomorrow morning! You call the strips of toast that you dip - soldiers!! I love my egss this way. My mom always made them for us soft boiled on saturdays! My Grandparents used to make these for breakfast all the time when I was little. I totally forgot how delicious and simple these are. I will have to make one now and relish in the nostalgia of soft boiled eggs. Thanks for the memories! Yum! I have another solution to the lack of egg cups and spoons: Baked Eggs! Personally, I like poached eggs, but I was trying to find a new way for my kids to enjoy eggs since they both seem to have forgotten that they used to love them scrambled. So, I was browsing through Mark Bittman's How to Cook Everything and ran across Baked Eggs. You just put a dab of olive oil in the bottom of a ramekin, crack the egg on top, and bake it at 375F for roughly 12 mins, give or take a minute depending on how you like your eggs. If you're feeling fancy, you can sprinkle some panko bread crumbs on top before you bake it. Also, a light sprinkling of kosher salt and a grind or two of pepper are the "icing." With a 1/2 tsp of olive oil and without the breadcrumbs, this is about 83 calories. OR I soft fry them "over medium" as an "egg in a basket". (use a non-stick pan & the egg sticks to the toast, not the pan. I always use whole grain toast too. It bums me out that you can't get this in restaurants. Gotta try the "Baked Eggs" thanks Julie. I love eggs. I use to love eatig duck eggs. Being a Vietnamese person, at least once a year we'd eat them. Not something so common for my family though. We'd boil them, use the bottom of the egg carton as the holders, and eat them with teaspoons. Teaspoons are sort of hard to use but I guess we just got use to them. In Vietnam, eating duck eggs are believed to make one intelligent and if a woman is pregnant, the child will have a lot of hair (for beauty).